Departure for Ashgabat from your city. Late night/Early arrival. Border passing, passport control and customs procedures. Meeting at the airport & transfer to hotel. 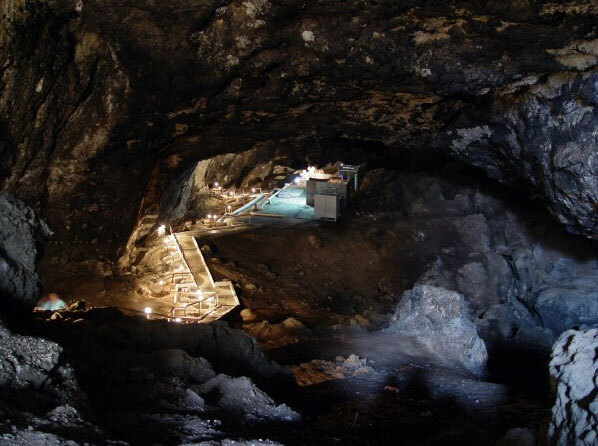 Morning drive to visit: Kow Ata Underground Lake (it is around 110 km and takes about 1,5 hours direct driving) where it is possible to swim (Some information about underground lake: Size of cave: length 250 m, depth 60 m, average width 25 m. Size of lake: length 75 m, max. width 23 m, max. depth 14 m. Volume of the lake - 6500 cubic meter, Temperature of the water 35 degrees annually). En route stop to visit: Saparmyrat Khadji Mosque built in Geokdepe Fortress (In the Geokdepe historical & cultural center 3 independent zones are distinguished :inside the fortress-memorial zone to hold rituals, outside the fortress-public zone for serving guests, pilgrims, travelers & archaeological zone-places of excavations & excursions. In its turn, memorial zone is divided into 2 parts. The first part is a large park, laid out in traditions of an ancient Central Asian gardens (Tchar-Bag) with canals, rituals grounds, alley of heroes & main square, in the center of which there will be a monument to defenders of the fortress. The second part of the memorial zone is an architectural ensemble, which consists of a mosque, buildings of medresse & new built local historical museum (entry fee is paid on spot) with a picture, demonstrating a heroic defense of Geokdepe in January,1881), Arkadash Stud Farm where one can familiarize with the stud-farm and Turkmen Horses - Akhalteke which thought to be the rootstock of Arab, Thoroughbred and etc (the farm has excellent horses around 22 & some of them became champions of Turkmenistan in the races and Horse Shows). Location of the farm is ideal as it lies just next to the desert. So possible organize excursion on the horseback around the farm (incase if there is good riding skills & for additional costs). After the lake drive back to Ashgabat via Geokdere & Julge valleys of Kopetdag Mountains to have a close impression of the mountains and new projects of government to turn Geokdere Valley into net of luxurious resort centers of Turkmenistan (it is around 150km and takes 2 hours direct driving). Arrival & rest. Morning visit Ashgabat's famous Oriental Bazar - Jygyldyk (Tolkuchka in Russian - open on Wednesdays, Thursdays, Saturdays & Sundays) where it is sold almost everything: camels (only on Sundays), carpets (only on Thursdays, Saturdays & Sundays), vehicles/cars (only on Sundays) and etc. where is possible to find plenty of souvenirs such as carpets, aladjas, handcrafts, felts, embroideries, jewelers (only on Thursdays, Saturdays & Sunday) and etc. It is also one of the best places to meet face-to-face with Turkmen culture and people. After bazaar drive to Mary. (it is around 380 km and takes about 4,5 hours driving). En route stop to visit the ruins of Medieval Bagabat Town, Anew Mosque, Abiverd Medieval Town Ruins & Kone Gala. Arrival & accommodation. 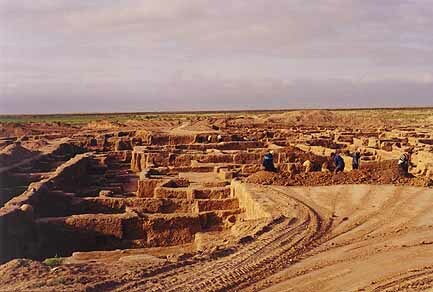 Drive to visit Margush Country (Gongur Depe-capital of Margush) - Bronze Age Civilization Sites & Birthplace of Zorastrism (4-3 mil. BC- 6th c. BC). (It is around 90 km and takes about 2 hours driving. 4WD is required). Lunch as a picnic. After SS of Margush drive back to Mary. En route stop to have SS of Old Merv known as Mary Shahu Jahan-King of the World for about 300 years became the biggest city in Asia & 8 years Capital of Khalifat, inscribed into the monuments list of World Heritage Book, protected by the UNESCO: Gyz Gala & Oglan Gala (6-7th cc. ), Complex of Askhabs (8-14th cc. ), Giaur Gala (4th c. BC), Buddist Complex (4-6th cc. ), Beni Makhan Mosque - first Mosque build in Central Asia (7th c.), Erk Gala (6th c. BC), Soltan Gala (11th c.), Soltan Sanjar Mausoleum (12th c.), Ibn Zeid Mausoleum (12th c.). Morning drive to the border pass "Farab-Alat" via Turkmenabat city (It is around 300km and takes 5 hours driving) to cross into Uzbekistan. Walk via the nutral zone (~600 meters). Meeting at the Uzbekistan side of the border pass by the Uzbekistan guide. Border Passing & Customs formalities. Drive to Bukhara. Arrival to Sacred Bukhara - one of the most esteemed cities of Islamic civilization. Hotel accommodation. Splendid herbal teas in the spice cafe "Silk Road Spices". Free time for rest and walking through the old streets of Bukhara. One of "1000 & 1 nights" in Bukhara. Full Day SS of Bukhara includes: Mausoleum of the Samanids - the most ancient of Central Asia brick building, a masterpiece of world architecture (9-10th c.), mausoleum Chashma Ayub that belongs to esteemed "places of trace" left by saint persons (14th c.). The legend says that once the bible prophet Job (Ayub) visited this place. Visit to museums of Imam Al Bukhari and The Museum of Water. Bolo-Houz Mosque - the only monument of medieval Bukhara (beg. of 20th c.), Ark - the center of Bukhara statehood (4th c. BC), silk carpet shops, complex Poi Kalon ("Beneath the Great"): Kalyan Minaret - the main symbol of sacred Bukhara that symbolized authority and power of spiritual governors. (12th c.), Kalyan Mosque- its area of 130x80 m surpasses Bibi-Khanym mosque in Samarkand, Miri Arab Madrassah - active madrassah is one of the most esteemed spiritual Islamic universities (16th c.), Taki Zargaron - the dome of jewelers (15-16th cc. ), Ulugbeg Madrassah - one of the 3 madrassahs constructed by grandson of Tamerlan - Ulugbeg (15th c.), Abdulaziz-khan Madrassah - traditional madrassah with 2 floors of hudjras and mosque on the central axis ( mid. of 17th c.), Tim of Abdullah-Khan madrassah (1588-1590 yy), atlas shops, Magoki-Attari Mosque - the most ancient mosque of Bukhara (12th c.) is considered a masterpiece of Bukhara architecture, Khanaka and madrassah of Nadir Divan-Beghi - a massive rectangular structure that was a place for staying and meditation of Sufis (17th c.), Kukeldash Madrassah (16th c.) - one of the biggest Bukhara madrassah, Lyabi-Hauz ensemble - the largest artificial reservoir of medieval Bukhara - is very popular among travelers (14-17th cc. ), Chor Minor ("Four minarets") is an unusual madrassah built by Caliph Niyazkul (18th c.). Overnight in quite and cozy Bukhara. Transfer to Samarkand via Shakhrisabz - a unique monument of town-planning and architecture (270 km, 3.5 hrs). Shakhrisabz tour: ruins of Ak-Saray Palace - Tamerlane's summer residence that shocked the imagination of his contemporaries (14-15th cc. ), Jahongir Mausoleum - mausoleum of Tamerlane's eldest and favorite son (14th c.), complex Dor-ut Saodat: Khazratiy Imam Mosque - a multi-stage mosque with a domical hall with decorated ayvans (14th c.), Gumbazi-Seiidan - mausoleum of possible offspring of Temur, Kok Gumbaz Mosque ("Blue dome") - built by Ulugbek on behalf of his father Shahruh (15th c.). The Golden Road to the historical town of Samarkand - a crossroad of the world's cultures, one of the most ancient cities in the world (90 km, 1.5 hrs). Hotel accommodation and free time. Overnight in a city which is a contemporary of ancient Rome, and has more than 2500 years of history. Full Day SS of Samarkand includes: Gur Emir Mausoleum - Tamerlan's tomb (14-15th c.) that was built for Temur's grandson Muhammad-Sultan and the tombs of three other Temurids - sons of Temur - Miranshah and Shahruh and his grandson Ulugbek, Ruhabad Mausoleum ("House of Spirit") - the legend says that under the dome there is a box with seven hairs of the Prophet Muhammad (14th c.), Registan Square ("A sandy place") - the major square of Samarkand: Ulugbeg Madrassah - Sheikh Khodja Akhrar and poet Djami were among outstanding graduates of the Madrassah (15th c.), Sher-Dor Madrassah ("Having tigers") (17th c.), Tillya-Kari Madrassah ("Coated by gold") - the richest gilding on the dome, walls and mihrab surpassed all other famous buildings in Central Asia (17th c). The mosque named after Hazret-Hyzr - an Islamic saint and eternal wanderer. He was esteemed as giving richness and good luck in far voyages and trade (19th c.), cathedral mosque Bibi-Khanym that was named after the oldest wife of Tamerlan (14th c.), the architectural complex Shahi-Zinda ("Alive king") - necropolis on the slope of the Afrosiab hill is connected with Kusam ibn Abbas - the cousin of Prophet Muhammad (11-15th c). Overnight in the capital of Tamerlane's Empire. Half Day SS of Tashkent includes: Chorsu - oriental bazaar, National park, Abdulkasim Medressa now is the centre for traditional arts with attractive souvenirs by local artisans (19th c.). Afternoon transfer for flight to Urgench. Arrival to Urgench the administrative centre of the Khorezm region. Drive to Khiva (30 km, 30 min). Arrival and accommodation. Full Day SS of Khiva - the only "Museum under the open sky" in Central Asia that has been completely preserved up to the present day. City tour around architectural complex Ichan-Qala" - the historical center of Khiva which has been inscribed into the UNESCO World Heritage List. City tour around the architectural complex "Ichan-Qala" (12-19th cc. 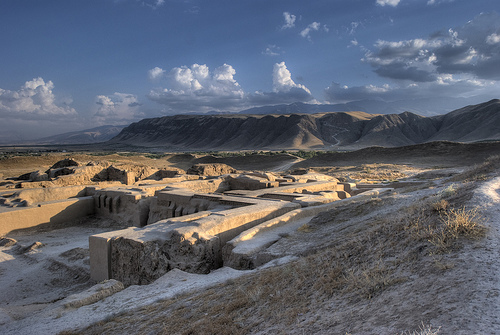 ): Kunya-Ark khan's castle - the inner citadel of Ichan-Qala (16-17th cc. ), Kalta Minor Tower (Short minaret) that would have become the biggest and tallest minaret in Central Asia (19th c.), Muhammad Amin-Khan - the biggest medieval medressa in Khiva (1845-1855 yy. ), Djuma Mosque with 212 wooden columns and a minaret 32,5 m height (10th c.), Tash-Hauli (Stone courtyard) palace looking like a fortress with a high battlements, towers and fortified gates (19th c.), Ak-Mosque (White Mosque) - a small quarter mosque by the gates of Palvan-Darvaza (1838-1842), necropolis of Pahlavan Mahmud - the cultic center of Ichan-Qala (1810-1913 yy. ), residence of Islam Khodja (1910 y) - the vizier of last khan. Ensemble consists of the smallest medressa in Khiva and a minaret whose top platform has a height of 45 m and is the highest observation point in town. Transfer back to hotel. Free time. Half Day Free Time in Khiva (relax or make walking tours & visit some bazaars/museums and etc). Afternoon transfer to Uzbekistan-Turkmenistan Border Pass Shavat/Dashoguz. Meeting at the Turkmenistan side of the border by Turkmenistan Guide at ~ 17.00AM. Border passing formalities. Transfer to hotel (20km & 20 min). Accommodation & rest. Drive to Derweze (It is around 340 km and takes about 6 hours direct driving. 4WD is required). En route stop to have SS of Kunya Urgench - the capital of Khorezmshahs (3-16th cc.) inscribed into the World Heritage Book of UNESCO: SS of the old city includes: Portal of Caravansaray (11-14th cc. ), Mamun Minaret (10-11th cc. ), Il Arslan Mausoleum (12th c.), Sultan Tekesh Mausoleum (13th c.), Academy of Horezm (3-13th cc. ), Kutlug Timur Minaret (14th c.) - one of the tallest minarets in Central Asia, Turabek Hanum Mausoleum. After SS of Kunya Urgench proceed to Derweze. Upon arrival to visit water based, clay based & burning gas craters. O/N in the tent near the burning crater. Morning drive to Ashgabat. (it is around 260 km and takes about 3 hours direct driving. 4WD is required). En route stop to visit Kekirdek Settled Nomadic village where will be introduction with life of the village: Visit one of the wells of the village and watch how they get water from it. Also there one can some information about Kara-Kum desert and its wells; how they cut sheep wool and make some rugs and felts; how they bake bread and ishlekli (one of the national meals cooked in ash & fire. ); how they milk a camel and they can taste the camel milk drink called "chal" and etc. Lunch in the Yurts or Wooden Decks - Tapchan put under mulberry & apricot trees. Late afternoon proceed the way to Ashgabat. Arrival & accommodation. Free time. Early Morning transfer to the airport of Ashgabat to catch a flight to yuor city.